The way-ahead-of-schedule resurgence of the Islanders has coincided with a partial return home, to the Nassau Coliseum, where they’re playing half their home games as they figure out a way to get out of Brooklyn. 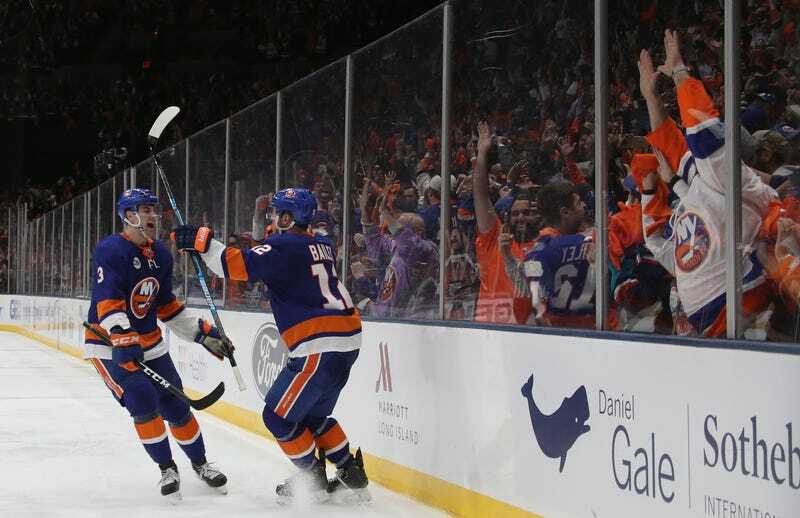 So it’s only fitting that their playoff opener was back in the old barn, thanks to an agreement to play the opening series in Uniondale (future playoff rounds, if they advance, will be at the Barclays Center). More than just fitting; it was a genuine boon for the home team. It was, well, an old-time Islanders hockey crowd. The fans tailgated and got themselves rowdy before they even entered the building. They sang the anthem. They chanted Lehner’s name throughout, and he gave them plenty of opportunities, making 41 stops. They chanted Matt Murray’s name, derisively. They were loud, flaring after each of the Isles’ three goals to take the lead, and barely dimming each of the three times the Penguins answered to tie. They only seemed really disheartened once, when Josh Bailey’s redirect clanged off a post with seconds remaining in regulation. Bailey, understandably, took it harder. “I was worried I’d have to see that one in my nightmares for a while,” he said. But overtime offers redemption. Bailey flipped the puck out of his zone in what was half a pass and half a clear, and there was Barzal to put on a stickhandling clinic to take both defensemen out of the picture before backhanding a shot off the post. And suddenly, there was Bailey surging into the play and sending home the rebound from a tough angle. Game 1 goes to the home team, 4-3. There was probably not a more appropriate duo to end things. Bailey is the longest-tenured Islander, a first-round pick in 2008 and one of just a few players who had played on Long Island before this season. Barzal is the face and future of this franchise, and had never known anything but the sojourn in the wilderness (of downtown Brooklyn). The Islanders are a franchise at a crossroads. There is a glorious history, but it’s so distant that the players would have to ask their parents about it. And yet the history echoes. (This was the winningest Isles team in 35 years, since the last squad to go to a Cup final. They also added to the franchise’s NHL-best playoff overtime record, now 34-16.) They are better sooner than they ought to have been, and yet have much to do to show this season hasn’t been an aberration. They do not really know where they’re going to be playing hockey in the coming years. They know they’re going to be playing at the Coliseum on Friday with a 1-0 series lead. Even if the future is wide open, past and present is enough for now.